For those that have followed my blog since it's humble beginnings over at Vintage Tea will know it's roots lay less in beauty hauls but car boot sale hauls. 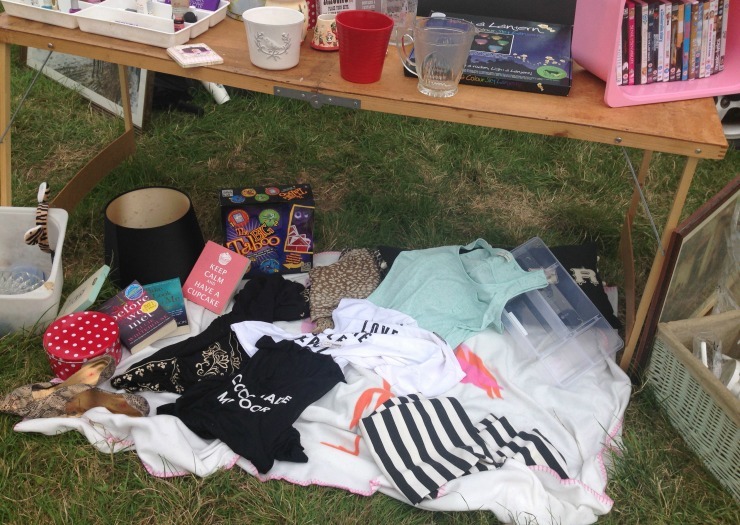 My first ever blog post was actually a car boot sale haul (read it here) and I spent many weekends whilst living at my parents scouring boot sales and charity shops for vintage treasures I would pack away for when I eventually moved home. Since I moved into my flat the boot sales have been abandoned until recently when a friend requested my assistance as she prepared to declutter in advance of moving home. Taking advantage I started gathering up bits and pieces that I could take along to earn a few pennies for my trip to Las Vegas next month. As it happened I ended up going to the boot sale without my friend when I heard she was getting up at 530am and instead went along to another which started at the more appropriate for me time of 1030am. It was quite fun as mum and I loaded up my dads 4x4 and I felt like long distance clara (showing my age with the Pigeon Street reference!) and I was looking forward to returning to the big open fields and a browse at fellow stalls for some trinkets to go in my bedroom which I'm once again decorating in a more vintage style. Sadly I couldn't believe how much the boot sales has changed since my absence. Admittedly it was rather a grim weekend, very windy and some rain and mum and I made our excuses and left after two hours although happy we had made enough to pay for our parking at Gatwick next month getting rid of a few items we would have usually passed on to friends. As you can see from my photo above there was nothing particularly fancy or vintage from my own wares so I guess I shouldn't have been too surprised that the majority of the stalls on offer - and despite the weather there were many stalls and customers - were either new items or people having clear outs themselves. If you are lucky enough to join me for dinner it will be served on vintage china and over the years I've collected full dinner services and/or odd plates or cups and sauces from boot sales. My bathroom has a Lloyd Loom laundry basket I picked up for a few pounds at a boot sale and there are pictures which will appear in my bedroom collected over the years. On my walk round the boot sale on this occasion I couldn't see one thing I wanted to treat myself to, not one solitary floral plate of even an Enid Blyton book to add to my collection. In fact there were not many books around at all obviously due to the increase of Kindles. Quite frankly the majority of the stalls seem to have nothing but junk on display. Of course one mans junk is another mans treasure and over the years my parents have rolled their eyes at some of the things I've brought home but it was quite a shame to walk around and see nothing but Primark clothes or old children's toys and no hidden treasures. And the customers, what a challenge they were. I wasn't asking a lot for my wares, happy with just a pound here and there, as I said my main goal was to ease the Vegas spending and get what I could for unwanted items and yes I undercharged a couple of young girls who wanted some of the make up I was selling but when a woman wanted a Clinque eyeliner for £1 rather than the £1.50 I was asking I remained firm - and she eventually paid what I asked. I like to haggle as much as the next person but everyone seemed to want something for nothing. I would argue I'd return to the charity shop rummage I also used to enjoy but they too have changed over the years as people become more savvy about an items worth or in some case ask more than is required. We've all seem clothes in charity shops that seem to be charging more than they would have originally sold for brand new. It's a shame a past time I once enjoyed so much has changed but on the bright side I will now have a perpetual box to fill with junk that I'll store up for the next boot sale I undertake and instead of hunting out vintage treasures in boot sales I'll go along to the local antique stores and appreciate that paying £5 for a floral tea plate is the going rate rather than the boot sale bargain of £1. This post was something of ramble and away from my usual beauty talk but I know there are some fellow readers who may have something to say about their local boot sales or vintage treasure hunts. So join in, are you a boot sale fan? Which car boot was this? I've only ever done the one in Battersea and have generally had great success - guess the weather affects it though as well. I've picked up some really good bits at the Battersea one and generally make over £100 a pop without selling everything. If you've got clothes, try selling them on Depop. I haven't been to a car boot sale in over 10 years and I stopped going because the very few I went to were terrible. In short people wanted £££ for their rubbish. I'm always amazed by what some people manage to find, I certainly didn't find anything! Couldn't agree more... anything I'd want is silly pricing and when I see bargains other people have found I wonder where they have been! I'm often surprised at how many people run their businesses at car boot sales. I always thought it was the place where people sold their hidden treasures but there are so many people who actually make a living from car boot sales. Everyone is an entrepreneur these days which is great on one hand but on the other it feels like some people just want to make a quick easy buck! I hadn't been to buy at one or sell at one for ages but I bit the bullet and went to sell on Sunday. I have to say it was pretty much exactly as you described! I had one woman buy a glass shelf that had a sticker on it for £5 (paid quite a bit for it from Next so I thought that was fair, even at a 'boot) but she haggled and I agreed £3, she then started counting all her coins and announced "I've only got £2.90, there you go!" So annoying! Still, made some money for my hollies from junk that would most likely have otherwise been chucked! Not in a rush to do another one though!! Charity shops I find are hit and miss regarding pricing, I went into one in York recently and the price tag on a card of 3 new hair grips was the store sticker price and they charged that. I paid as it was a charity shop but some of them are getting pricey these days - and its rarer to find a treasure. The best I found at a boot was a Harry Potter first print run paperback with JK's full name inside in print rather than the 'JK', rare apparently, still got it! Well done on your Harry Potter find! As you know, I'm an avid bootsale fan, and I think that bootsales vary massively from excellent to absolutely rubbish, dependent on area, time of year, regularity etc etc. I haven't sold at a bootsale for years, but the last time I did so, I remember woman picking up a quite nice weekend bag/holdall type thing I was selling, examining it in intricate detail, opening all the different zips etc before asking me how much it was. It was towards the end of the sale, and I said '50p' as I just wanted to get rid of it, and she put it down and walked away. As she did so, I said ' you know what? Take it, just have it for nothing'. And she still didn't!!! Weird, huh? Haha, those plaster/wall paper tables are such a classic thing to take to a car boot. I've not been to a car boot in ages but I remember coming home with some right junk. I got all these brass jugs and cups when I was younger, my mum really hated them but I loved them haha. They do seem to be 80% kids toys and clothes, both of which I bypass (I have enough clothes!). Sometimes you find nothing at all and others you'll find something worthwhile - but yes if the price asked seems reasonable I'll pay it and not haggle. Glad it's not just me seeing an sea of old toys and clothes!